G.P. Putnam's Sons, 9780399168925, 384pp. A behind-the-scenes tour of New York City’s dynamic food culture, as told through the voices of the chefs, line cooks, restaurateurs, waiters, and street vendors who have made this industry their lives. 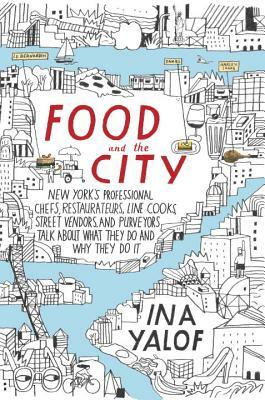 In Food and the City, Ina Yalof takes us on an insider’s journey into New York’s pulsating food scene alongside the men and women who call it home. Dominique Ansel declares what great good fortune led him to make the first Cronut. Lenny Berk explains why Woody Allen's mother would allow only him to slice her lox at Zabar’s. Ghaya Oliveira, who came to New York as a young Tunisian stockbroker, opens up about her hardscrabble yet swift trajectory from dishwasher to executive pastry chef at Daniel. Restaurateur Eddie Schoenfeld describes his journey from Nice Jewish Boy from Brooklyn to New York’s Indisputable Chinese Food Maven. From old-schoolers such as David Fox, third-generation owner of Fox’s U-bet syrup, and the outspoken Upper West Side butcher “Schatzie” to new kids on the block including Patrick Collins, sous chef at The Dutch, and Brooklyn artisan Lauren Clark of Sucre Mort Pralines, Food and the City is a fascinating oral history with an unforgettable gallery of New Yorkers who embody the heart and soul of a culinary metropolis. Ina Yalof has been writing books and articles about such diverse subjects as medicine, science, religion, and happiness for more than thirty years. Her books include the widely acclaimed oral history Life and Death: The Story of a Hospital, What It Means to Be Jewish, How I Write (coauthored with Janet Evanovich), What Happy Women Know, and Food and the City. Yalof’s articles have appeared in numerous national publications, including GQ, Harper's Bazaar, and New York magazine. She lives—and eats—in New York City. --Marcus Samuelsson, James Beard-award winning chef and New York Times-bestselling author of Marcus off Duty and Yes, Chef!